Needtovent's amazing "LOSER" contest has sparked more excitement than even we anticipated. Contest headquarters finds itself overwhelmed with nearly a half dozen official entries. Rest assured, we will continue to try and unbury ourselves from this enormous pile -- the end result of needtovent once again capturing the imagination and the heart and the mind of all our minions in cyberspace. So one last reminder -- this contest comes to a close at midnight tomorrow, Monday, March 20th. Don't miss out on being a part of something more exciting than the women's curling quarterfinals. We need your entries now. We have already received a plethora of brilliant submissions and we expect more in these waning hours. However, it appears more and more unlikely that anyone will nominate Steven Brodie as their choice for being the all-time LOSER. Who? STEVEN BRODIE, that's who. 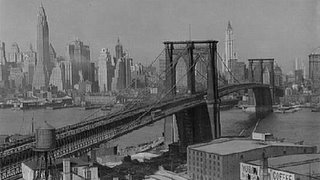 You see, Mr. Brodie earned everlasting fame and notoriety among carnival workers nationwide when he jumped off the Brooklyn Bridge in order to win a $200.00 bet. Mr. Brodie survived. More importantly, so did his legacy as being perhaps the dumbest person alive in 1886. You see, Mr. Brodie achieved this remarkable feat without insuring there would be witnesses to corroborate his claim. And so carny slang soon deemed the easiest of all "marks" to be a "Brodie" -- someone so stupid that they stand out among all others. Mr. Brody did not get his $200 -- but you can still win our Grand Prize! Don't be a Brodie; enter now and enter often.